Sixty-two of the 150 seniors graduating from Lancaster Mennonite High School received awards this spring. Forty-six Presidential Academic Fitness Awards were granted. The Presidential Academic Fitness Awards are given to students to maintain a 3.5 GPA and achieve in the eighty-fifth percentile or higher in the mathematics or verbal sections of the SAT or ACT college entrance examinations. 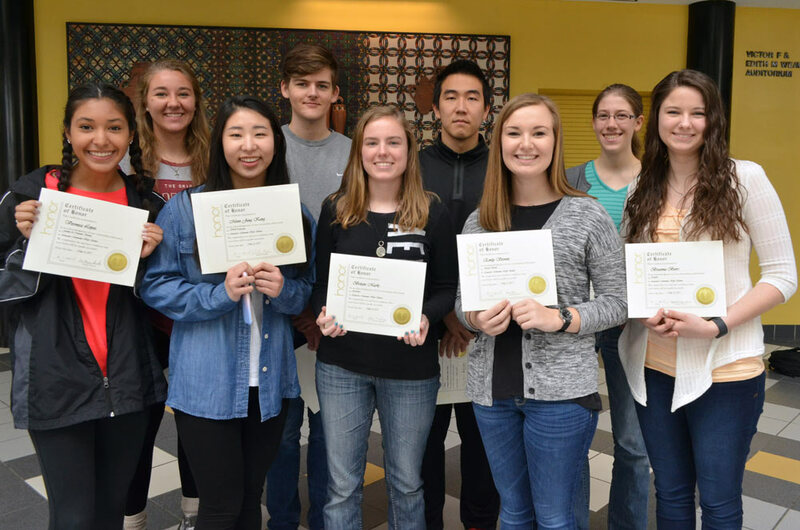 Six seniors received the LMS Alumni Association Award for exemplifying the school’s mission of educational excellence, Christ-like peacemaking and service. Breanna Beers, daughter of Joshua and Anna Beers, Lancaster, received the English Department Award, the Presidential Academic Fitness Award and the Alumni Association Award. Jiaxin Wu, daughter of Lv Wu and Hong Chen, China, received the Art Department Award, the LCYA Gold Key for Drawing and the Scholastic Art Gold Key. Ethan Beiler, son of B. Anthony and Kathleen Beiler, Cochranville (FFA Keystone Degree and Presidential Academic Fitness Award); Charlie Gish, son of Dr. Jonathan and Karen Gish, Wrightsville (Principal’s Leadership Award and Presidential Academic Fitness Award); Weifeng Han, son of Minghua Han and Lili Wang, Wenzhou, Zhejiang, China (Mathematics Department Award and Presidential Academic Fitness Award); Xinyi Huang, daughter of Erwen Huange and Yanhong Liao, Nanning, Guangxi, China (Alumni Award and Presidential Academic Fitness Award); Moon Jung Kang, daughter of Heungsub Kang and Heayeb Cho, Ilsan, South Korea (World Language Department Award and Presidential Academic Fitness Award); Cassidy Mara King, daughter of Nolan and Nori King, Cochranville (FFA Keystone Degree and Health and Physical Education Department Award); Joey Tsz Ying Lam, son of Eric Leung Chu Lam and Iris Yun Ngan Fan, Quarry Bay, Hong Kong (Presidential Academic Fitness Award and International Student Leadership Award); Britani Marks, daughter of Terry and Ann Marks, Holtwood (FFA Keystone Degree and Agriculture Department Award); Ian Martin, son of Dr. Jeffrey and Kristina Martin, Lancaster (Presidential Academic Fitness Award and Alumni Award); Janelle Miller, Douglas and Julie Miller, York (FFA Keystone Degree and Presidential Academic Fitness Award); Janell Preheim, daughter of Arlan and Dori Preheim, Lancaster (Music Department Award and Presidential Academic Fitness Award); Hope Rutter, daughter of Dr’s Chad and Deborah Rutter, York (FFA Keystone Degree and Presidential Academic Fitness Award); Olivia Umstead, daughter of Todd and Dawn Umstead, Lancaster (Scholastic Writing Gold Key and Presidential Academic Fitness Award); Julia Wilson, daughter of Michael and Tricia Wilson, Lancaster (Presidential Academic Fitness Award and Alumni Award); Jialiang Zhang, son of Junfeng Zhang and Ling Wei, China (Science Department Award and Presidential Academic Fitness Award); and Wanyue Zhu, daughter of Qi Zhu and Chengyan Dai, Nanjing, Jiang su, China (Scholastic Writing Gold Key and Presidential Academic Fitness Award).